Like Patty and me, this easy to get along with character loves all manner of tropical life! Just like some uninhibited, life-loving, young, co-ed collegians, this smallish, deciduous tropical shrub is an exuberant, year ‘round bloomer. Though in the Euphorbia family, it is like Patty and me otherwise in that this easy to get along with character loves all manner of tropical life! Perhaps, more importantly, those with a brown thumb can appreciate that it requires limited attention, virtually no water and actually expects to dry out between waterings! It is equally at home in a pot or garden soil in full sun or partial shade and demands the scantest of attention. But weather that is cool, or wet “feet” from overwatering, can be fatal. In full sunlight its approximately 6-inch leaves (nearly a foot when grown in the shade) have five lobes and can be as wide as a foot across. The palmate leaves have five pointed lobes separated by deep notches. “OK”, you ask, “What’s a lobe to a plant?” Well, Kirsten Albrecht Llamas in her American Horticultural Society award winning book “Tropical Flowering Plants” (available for ordering through our web site – http://www.olabrisagardens.com) describes a lobed leaf as one “with the edges divided into pointed or rounded sections”. 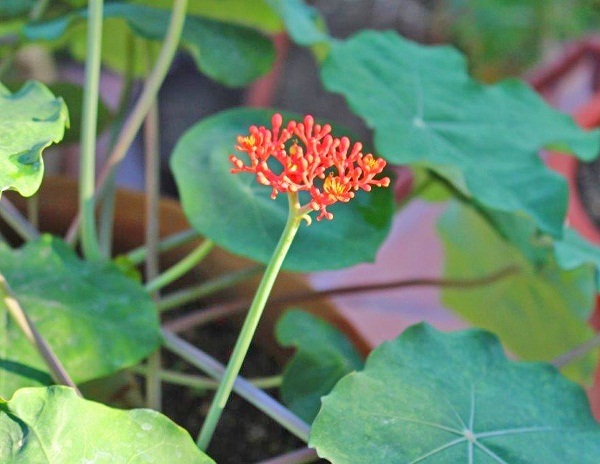 Atop its sturdy stems are small, long lasting, clusters of blooming, coral-red flowers. One can easily see how the Jatropha podagrica got the common names of Bottle Plant, Gout Plant and Buddha’s Belly. This is a result of the bottle-like caudex (read: “swollen, succulent stem”) at the base of its generally unbranched trunk. This distinctive, thick and swollen stem has numerous bristled scars. At its base, the surface is grayish-white in color, while higher up it seems to have a more greenish hue. Near the top of the bulbous structure, that somewhat silvery surface texture changes color to a bright green, and the number of scars and other defects diminish. And as a bonus, its mature green fruit displays beautifully against the bright branching stalks of the flower cluster. 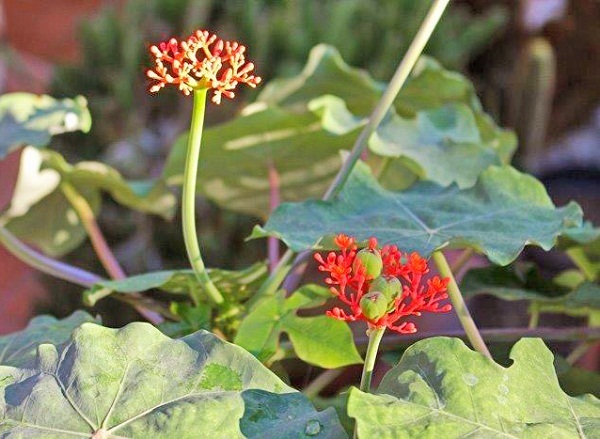 Having his poetic way of words, Louis “The Plant Geek” describes the Jatropha podagrica as “Sculptural, (with) the whirl of large foliage at the tip (being) in strong contrast to the bare swollen trunk below.” The Gout Plant’s glossy young leaves are a glossy bright green with prominent veins radiating out from their center. As they age, they lose their glossiness. But be prepared to see just how fast these leaves and stem stalks grow! Its blueberry-sized fruits are “explosively dehiscent”. It can reach a height of two to five feet and two feet in width. And creatures beyond us humans appreciate and enjoy them. With nectar that has been described as “ambrosial”, it is a major draw for hummingbirds and butterflies. But take note, the rest of the plant is highly poisonous, especially its seeds – hence, that other of its common names, Purging Nut. Speaking of those seeds, these blueberry-sized fruits are “explosively dehiscent”. This means that they possess that somewhat unique skill of being able to throw their seeds. So, keep an eye open for when the seeds ripen and turn brown, as they will burst open and aggressively launch the seeds up to several feet away. 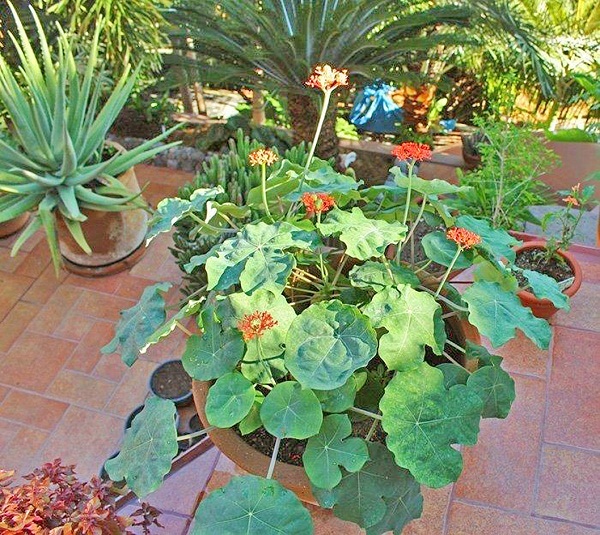 Jatropha podagrica prefers what might well seem to be – a too small pot. One should “pot-up” only when the plant seems ready to burst through its present one or has become so top-heavy that it has difficulty standing upright. Moving your Gout Plant to a larger pot too soon could increase the likelihood of the soil’s remaining too moist. Placement? It’s attractive enough to be employed as a piece of botanical sculpture planted alone along a path, as a feature atop a stone plinth or at the end of a bench against a wall. Gout Plant should handled as to how one would maintain a cactus – in very well-draining soil, allowed to dry out between waterings and fertilized monthly when the plant is in active growth.